Country's largest annual book festival ‘Amar Ekushey Grantha Mela’ is underway on the premises of Bangla Academy and at the adjacent Suhrawardy Udyan in the capital. This year, popular writer and dramatist Palash Mahbub has participated in the festival with his seven newly published books. Among them, five books have been published by Panjeree Publications Ltd. while two others have been published under the banner of Katha Prokas Prakashani. The books are ‘Kom Boyosi Sondha’ (novel), ‘Porir Kachhe Jorir Chithi’ (children’s funny story book), ‘Lalur Lal Jama’ (Liberation War-based novel for the youth), ‘Bristira Tin Bon’ (poetry/rhyme book), ‘Taali’ (children’s story book), ‘Babuder Bajimat’ (novel) and ‘Thomoz’ (comedy novel for children). 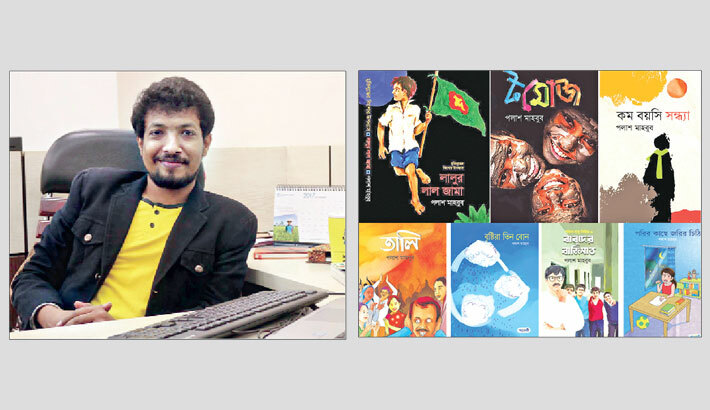 Palash Mahbub has been involved with his writing career for more than two decades. His first book came out in 2000. Since then onwards, he has authored many books and received a few awards as the recognitions of his works. The list of his awards includes Agrani Bank- Bangladesh Shishu Academy Shishu Sahitya Puraskar, Unicef Mina Award, ACI-Ananda Alo Sahitto Puroskar and West Bengal’s Annada Shankar Ray Shishu Sahitya Puraskar.